One popular method of treating waste water involves storing it in evaporation ponds or storage ponds. As with other lining containment applications, the engineering objective is to eliminate any seepage outside the ponds. Geomembrane liner has accomplished this objective for the last 30 years. We have the latest factory fabrication and field installation technology to insure a first quality project. PVC has been the dominant polymer in this market due to its ease of installation, market performance and cost effectiveness. 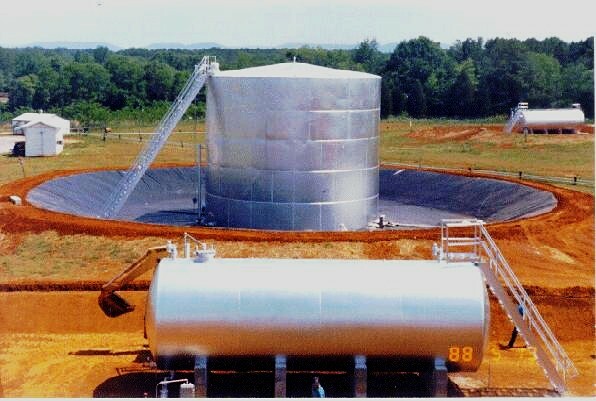 Geomembrane liner is an effective containment membrane used in tanks to hold a wide variety of liquid - water, wastewater, treated sludge, fuels, gasoline, etc. We can manufacture drop-in tank linings for smaller projects to eliminate any installation costs. We fabricate a wide variety of polymers in order to be able to select the right material for your project. Many municipalities or industrial facilities rely on aeration to treat, reduce or eliminate sewage. 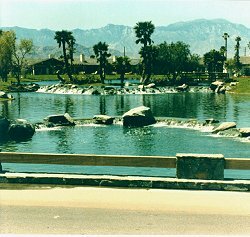 This aeration will typically take place in a single or a system of ponds. 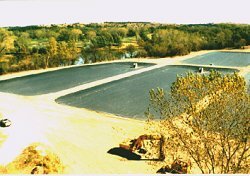 Geomembrane liner provides the containment to protect the soil and groundwater beneath these ponds. Polypropylene is an emerging material used in this application due to its long term service life and excellent physical properties. 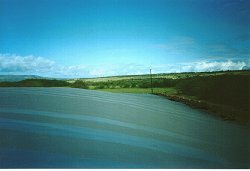 Impermeable plastic geomembrane liner has been used in many applications for prevention of seepage, which results in pollution. They are now being used under oil storage tanks and in diked oil storage areas. Many states require that provisions be made for containment of oils and hydrocarbons if the containing vessel should rupture. 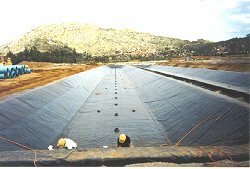 Plastic geomembrane liner placed under above-ground tanks or lining diked storage areas provide this safety feature. 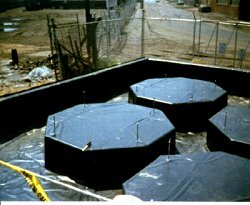 We can design, fabricate and install a containment system to provide containment if needed while exceeding regulatory requirements. Whether your project involves fuel, gas or any other hydrocarbons. 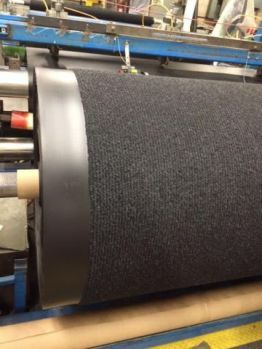 We can choose the best material for your project as we work with many different Polymeric materials. Potable water reservoirs are a crucial element in the treatment system of many municipalities throughout the world. 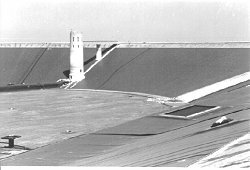 Many older reservoirs are built with concrete or asphalt bottoms which have leaked significant volumes of water costing millions of dollars. We have provided a solution to this problem for over 30 years. No matter how small or large, easy or complex, we can install a lining for your reservoir. Geomembrane liners offer design versatility, easily adapting to the contours and shapes of your ponds. They prevent water and fertilizer run-off from seeping into the ground. Flexible materials install easily and quickly. And, once installed, they're virtually maintenance-free. When it's time to beautify an add challenge to your course, the solution is often "just add water". Today's sophisticated fish farming procedures demand a more manageable, controlled environment that can be achieved by an unpredictable mud-bottom pond. As fish hatcheries respond to the increased demand for edible fish, synthetic geomembrane liners are being used for ponds to provide better control, increased production and decreased maintenance. With the pond bottom not covered with soil, the pond operator can control the chemical and biological condition of the pond, and thus reduce chances of disease and other imbalance in the aquaculture environment. 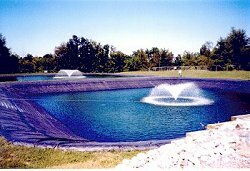 In addition, synthetic geomembrane liners reduce or eliminate grass mowing on the side slopes of the pond, stabilize soil moisture content caused by fluctuating water levels, and reduce shrink/swell soil instability problems caused by too wet or to dry soil. PVC linings have been used in North America to contain water in transport canals since the early 1950's. Initially 10 mil PVC was used for all of the early projects but was later replaced by 20 mil PVC due to the cost effectiveness of the material. The U.S. Bureau of Reclamation (under the Department of the Interior) and the Province of Alberta have successfully installed millions of square feet of PVC in their canal systems. Leakage loss of this water has been eliminated through the use of PVC linings allowing water to be transported to population areas that do not have adequate water sources of their own. If you live in these areas, PVC has been a critical factor in your lifestyle. Just as Federal and State Regulations detail every aspect of landfill location, construction and operation, they now detail every aspect of its closure design. A typical MSW landfill cap, from bottom up, consists of gas-venting layer, a low-permeability barrier layer (soil, a geosynthetic clay liner and/or a geomembrane), a barrier protection layer and a vegetable soil layer. Closure requirements are critical for the post closure life cycle of a landfill as many landfills do not have synthetic membrane linings to prevent the filtration of leachate into the groundwater. Consequently the formation of leachate within a landfill cell must be prevented at all cost. Throughout history there has always been the need to dispose of the waste generated by man. Raw sanitary and industrial sewage was emptied into rivers and lakes. Solid wastes were either incinerated, buried or deposited in the ocean. When the population of the earth was much smaller than it is now, these methods provided the most efficient means of disposal. They were also relatively safe in so far as public health was concerned as nature was able to safely break down the disease carrying bacteria and other organic materials and render them harmless. However, as the population grew the lakes and rivers became so saturated with sewage that nature was unable to keep purifying the waters and pollution of such major proportions occurred, that it threatened public health. At the same time sanitary landfills were being used without regard for water purity, with the result that pollution found its way into our groundwater causing many problems ranging across a wide spectrum. One solution to prevent this pollution was to place a liner within the landfill. Some of the materials used were clay, bentonite, asphalt and plastic membrane liners. Since impermeable plastic membranes have been used successfully for years in preventing seepage of water and various waste liquids, it was only logical that these be considered for sanitary landfill use. In addition, they have long life, are highly resistant to leachate and have the proper mechanical properties to be successful in this application. We have supplied and installed containment linings for MSW Landfills since the 1970's. Federal RCRA Regulations enacted in the mid 1980's has dramatically increased the demand for landfill linings. We have worked with various government authorities and industry associations to adopt QA/QC procedures and specification guidelines. Both PVC and Polypropylene have been used in this application successfully.